It was a night of wild musical progressions and experimental madness! Animal Collective came to Boston last night - embarking on their Fall 2007 tour in a City that is absolutely overrun with College kids with pocket money from home. The results were predictably electric! The Collective, known for their inventive musical presentations and stranger stage names, appeared on a stage decorated with skeletons last night. The backdrop for the set was an 11-foot tall skeleton centered on the back wall - almost making the Avalon an appearance of an Animal Collective Cathedral. Not sure what the message was there or why the other smaller skeletons were wearing ball gowns and tutus - but that's the way Animal Collective rolls, I guess. 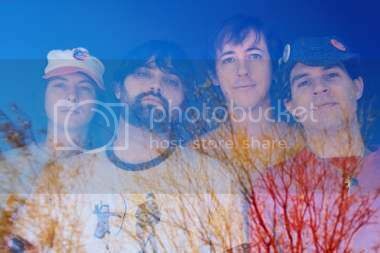 Animal Collective's new album "Strawberry Jam" will be formally released next Tuesday. One would reasonably expect that the night will be filled with these songs - but this was not at all the case. 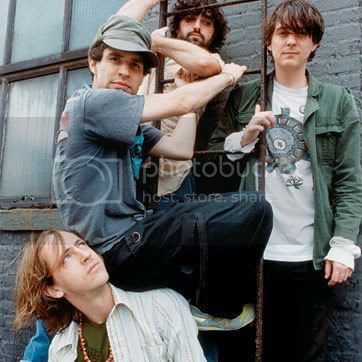 (Animal Collective played four songs off the "Jam" album, a few from the "Song Tungs" LP and the rest were from the as-of-yet unnamed new album!) There were a few reasons why, I suppose, the band would not center on the songs from the album being released next week... The Collective have been living those tracks for months now and have already moved on to new material! Furthering this fact: The Strawberry Jam tracks leaked on the internet months ago. I polled a few fans last night. The results, at least to some outsiders and record execs might surprise: "Yes, they had the album (the leaked songs) already on their personal computers." - and, "Yes, they would be buying the album when it gets out next week. Definitely." Time will only tell if that plays out as truth. There are some advantages to staying ahead of the pack. When Peacebone, - the first single and video released from the Strawberry Jam album, the crowd went wild. This was not the reaction one would expect for a song that was introduced just days before. This audience had been listening for far longer - thanks to the leak. Interesting. I have seen hundreds of live shows and this may have been one of the strangest, trippiest I have ever witnessed. The band only stopped once the entire night. The space between the songs was filled with long, progressive and sometimes cacophonic electronic rage. These inevitably unfolded into a new dynamic fare... I spent a couple of minutes between every track thinking about how weird and loud the whole thing was and the next thing I knew I had hypnotized by the rise and fall of the latest beat. In a few more minutes you were back out the back side of the song and free to use your mind again. Very intense! During "Peacebone" the fresh-fros and soph-dreads (my term for the audience - mostly in their first two years at University) were bobbing around in front - the band has one hell of a following. The Avalon holds 2,000 people and the place was filled last night - and during the middle of the week. If this precedent holds up, Animal Collective has one hell of a tour ahead of them this fall. I think the band will agree that Boston was a great start. We were there last night! What a mix with the redsox crowd eh? Did you notice the new Halloween stage set with the skeletons and stars etc? Loved that... we made THIS in honor of the tour, so everyone can know exactly where they are at all times! I have to say tho the volume was just a little loud. They should put in a little contrast, some softer stuff like Winter Love or maybe the odd song where you can hear the guitar and words - it tends to turn into a long stretch of sequencer drone after a while, tiring... and it would be nice if they said hello to the fans instead of mumbling with the echo box on! of course it was easy to think we were suddenly in the midst of a grateful dead drums/space break too.